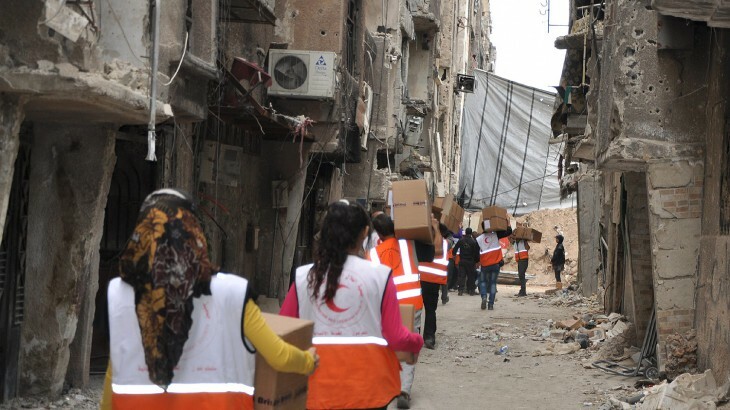 Geneva/Damascus (ICRC) – The International Committee of the Red Cross (ICRC), working closely with the Syrian Arab Red Crescent and the Palestine Red Crescent Society, today delivered urgently needed chronic disease medicine for people living in Yarmouk camp, home to the largest Palestinian refugee community in Syria. In coordination with all parties concerned and on the basis of a rapid needs assessment carried out by the Palestine Red Crescent, the main health-care provider in the camp, the ICRC delivered a three-month supply of medicine sufficient to treat over 5,000 people suffering from chronic diseases such as diabetes and heart disease. It also delivered blankets, towels, bedsheets, gloves, scissors and similar items to enable pregnant women to deliver more safely and hygienically. The ICRC is reminding all parties of their obligation under international humanitarian law to protect and spare civilians at all times and to facilitate the safe delivery of neutral, impartial, and independent humanitarian aid to all people directly affected by the fighting. The ICRC has been assisting millions of people since the onset of the conflict. Every month, the organization delivers food and other essential relief items to over 450,000 people.